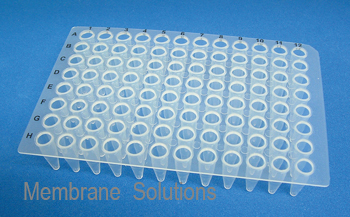 PCR Plates are made of specially formulated high quality polypropylene. Nature-color PCR plates are compatible with most thermal cyclers and are ideal for ideal for high throughput screening thermo cycler applications. Smooth, thin, uniform well walls ensure accurate thermal transform. Ultrathin walls accelerate heat transfer provided shorter cycles. The PCR Plates have an alpha-numeric coding system for easy identification and do fit to all common thermal cyclers. Low-Profile-Plates are recommended in case of small sample volumes, as the dead-room will be reduced between sample and heated lid. Alphanumeric coding in black letters, which are good to view, when loading the plates. The plate has a working volume of 0.2ml per well. 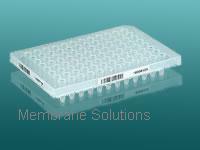 These 0.2mL multiwell plates are specifically designed for PCR applications. Certified Rnase/Dnase, and pyrogen free to ensure purity.